There are three main tools for the SaaS lead generation: lead capture forms, live chats, and chatbots. Using chatbots is the most cost-effective way among these alternatives to generate qualified leads for the sales team. Are there case studies to prove that? Of course! Let's learn what successful SaaS companies are doing. 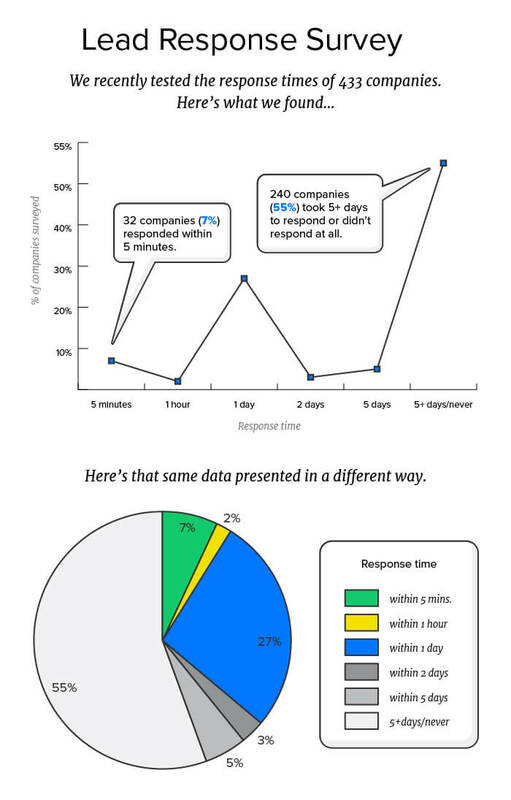 The ideal timeframe for responding to a new lead is within the first five minutes, according to research from InsideSales.com and Harvard Business Review. Respond in ten minutes instead of five? You’re looking at a 400% decrease in your odds of qualifying a lead. Most companies lose leads. A chatbot seems to be the single solution to handle this. A chatbot can respond within the first five minutes. A chatbot works 24 hours a day, 365 days a year. Chatbots can answer to an unlimited amount of users at the same time. You will need less employees to answer to all the questions manually. Perfecto Mobile is a SAAS product that offers suites targeting at functional, automation and performance testing respectively. The total funding amount is $84,900,000 since launch. 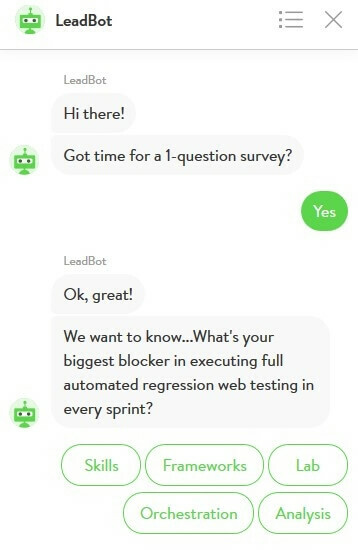 The chatbot on the Perfecto Mobile's SaaS product website grew their conversion rate from 6% to 20%. That works out to nearly 4x increase in conversion rate overall. Chris Willis, ex-Chief Marketing Officer at Perfecto Mobile, was interested in being able to filter out the noise that’s associated with traditional live chat. He needed something that would let his sales development reps (SDRs) focus on having conversations with just those people who were likely to buy. "We were sitting at about a 6% conversion of our web traffic, which is about the industry standard. But what we wanted to do was increase the overall conversion rate of traffic because our traffic was pretty good," said Willis. After six months of using the chatbot, that number climbed to 20%. Chris also discovered that by letting leads “skip the form” and chat in real-time, he could reduce the time it took a lead to move through the sales funnel. "Leads that come in through chat tend to have a higher velocity. So you’re able to solve the problem or meet the needs of the request in real-time. So you think in terms of somebody coming to a website, and having a question, and filling in a contact us form. And they’ll hear back in 24 hours, or two days…that problem might not be there anymore. If they’re able to initiate a conversation, so skip the form, and have a conversation in real-time, we’re seeing that move very quickly," said Willis. An anonymous visitor came to the Perfecto Mobile website and started a conversation via the chatbot. The anonymous visitor turned out to be someone from a major sports brand and they wanted to meet in-person with a sales rep. Drift is a SaaS-based messaging app for sales and customer success teams. Total Funding Amount: $47,000,000. The chatbot on the Drift's SaaS product website added 15% more leads to the top of Drift's funnel. Leads from the chatbot close more quickly: 3 days from conversation to demo. routing chats to the right department (e.g. sales, support), as well as to the right sales rep based on territory. responding to questions that they already have answers for in their help desk. qualifing leads in real-time, 24/7, even when all of their sales reps are asleep. They just take the questions their sales reps are already asking and turn them into a script. 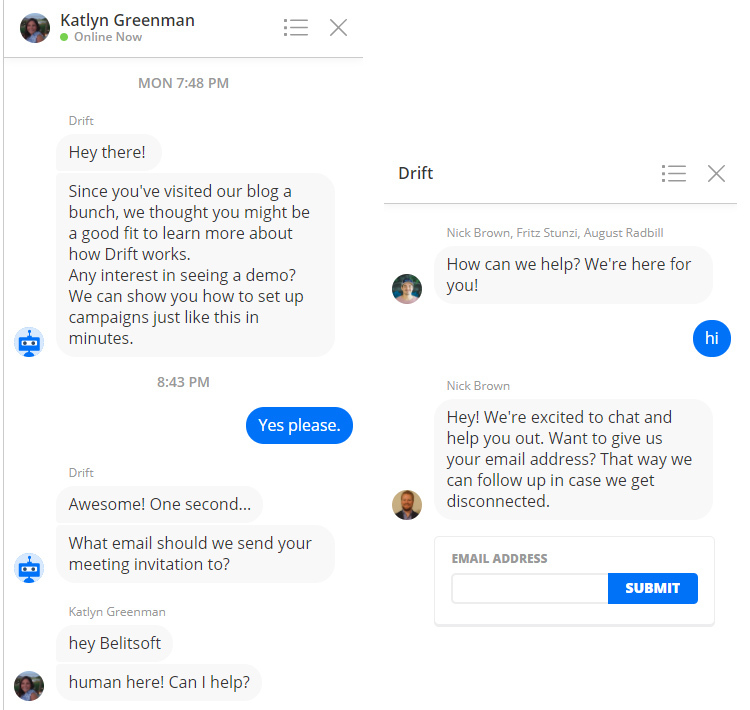 The chatbot pops up in the corner of their pricing page and asks, “What brought you here to check out Drift?” before continuing with a couple more qualifying questions. "Of the people who click on that message, 63% end up starting a conversation with one of their sales reps. For comparison, the benchmark email click rate from MailChimp data ranges from 2% to 3%," said Devaney. RapidMiner is a SaaS platform for a predictive analysis. It extracts the needed data and displays results in a way that users can easily determine trends and future outcomes. The total funding amount is $36,000,000 since launch. The chatbot on the RapidMiner's SaaS product website now conducts about a thousand chats per month. It resolves about two-thirds of customer inquiries; those that it cannot, it routes to humans. In addition to Chief Marketing Officer, who is monitoring the tool’s interactions, two co-op college students support the inquiries part-time. Like many software companies, RapidMiner offers free trials, and Tom Wentworth, Chief Marketing Officer at RapidMiner, was struggling to serve the approximately 60,000 users who come to the company’s site each month for the free trial. Many of the visitors using RapidMiner’s software, and needing help, are not paying anything for the service. So, how could Wentworth help them in a cost-effective way? The company had a popular chat feature on its site, but its salesforce was overwhelmed — and spending a great deal of time — sorting through the chat sessions to find potential customers. It was like looking for the proverbial needle in a haystack. 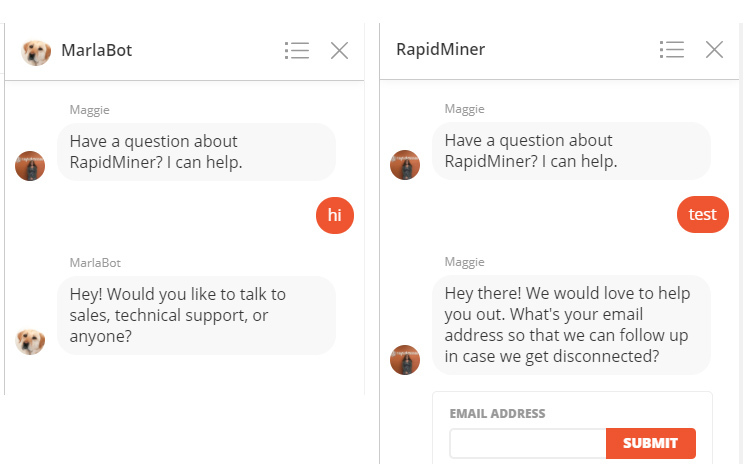 Wentworth approached a friend who suggested he try a chat tool, which would ask a visitor initiating a chat, “What brought you to RapidMiner today?” The visitor would respond, and the chatbot would provide one of seven potential follow-up answers. For example, a visitor might say, “I need help,” and the chatbot would send him or her to the support section of the website. Wentworth started small, running the tool on a few of RapidMiner’s smaller web pages to test how helpful it was. In less than two weeks, he had deployed it on every page. Belitsoft provides custom software development services for SaaS companies. We have experience in creating both lead capture forms to collect leads on landing pages and chatbots from scratch. Recently, we have developed a chat-bot that adapts automatically its design and “call to action” phrases to a webpage’s design and content. Belitsoft also provides customization of ready-for-use third-party commercial or open source solutions, including designing conversational interfaces. Customization is required very often because ready-for-use solutions may not be fit with your company requirements.